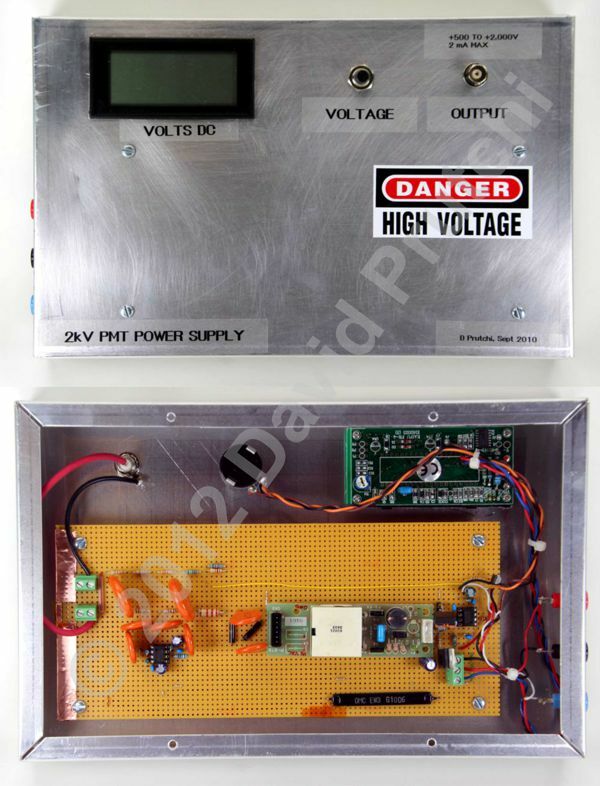 We are posting this picture to help you build your own power supply. It shows the BXA-12579 that has been modified as described in the book. The op-amp to the right of the CCFL module is used to control the voltage supplied to the module. The high-voltage AC output of the inverter is rectified and doubled and filtered by the diodes and capacitors at the left of the CCFL module. In addition, this design incorporates a circuit used by Spectrum Techniques to reduce ripple in their PMT power supplies. The op-amp to the left is used to neutralize AC signals from the high voltage output by adding a voltage that is 180º out of phase with any signal that goes through its coupling capacitor. A very stable and clean output can be obtained if the circuit is built within a grounded, metallic enclosure, being careful to prevent coupling of the high-voltage AC output into the rest of the circuit.